Our friends and partner at Digital Imaging Solutions will soon release this desktop high security ID card printer with retransfer and laser engraving technology. How big is this? It is like comparing an old IBM mainframe computer that filled a large room to a modern desktop PC that has many more times processing capability. I was in a meeting this morning and it was pointed out that combined we had over 100 years of ID card making experience in the room from our company. 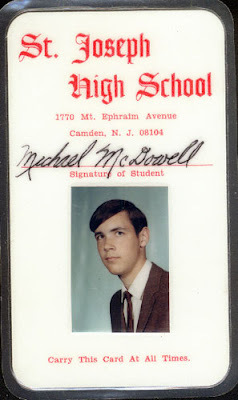 It reminded me of how labor intensive and unsecured photo ID cards were back in the day. Today we can make a card faster, for less money, many times more secure, and with a number of intelligent technologies on-board. Yes, we have come some distance. I promise it's me. I'm in the photo! 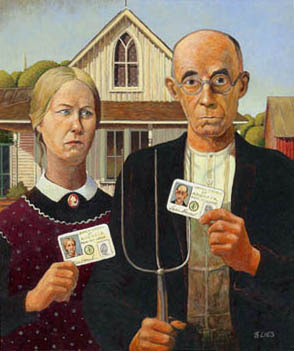 We say: Great idea, but how do you create an official photo ID for an undocumented person? Zebra’s reliable HC100 Wristband Printing Solution makes wristband issuing easier and more cost-effective than laser solutions. 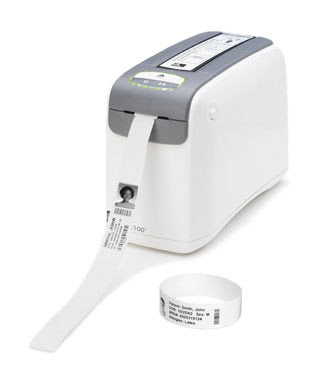 This solution combines the reliable HC100 direct thermal printer with easy-to-load cartridges containing the industry's only antimicrobial-coated wristbands—Zebra’s Z-Band® wristbands. Minimal training! Pop the wristband cartridge into the HC100 printer—print individual wristbands on demand. Compare these two simple steps with laser printing, which often requires staff to load forms into a special tray, print labels, apply a label to the band, and fold a laminate over the band. The HC100 printer automatically detects the loaded wristband size and automatically calibrates its settings for optimal print quality. Print names, bar codes, even monochrome images at the click of the mouse. We Say: Zebra designed these with hospitals in mind, but schools are also finding these wristbands useful for visitors, sporting events, tardy ID, field trips, and more.